The Washington Nationals have made a huge mistake by shutting down ace pitcher, Stephen Strasburg, for the rest of the season. The move made by team management is not fair to the team, to Strasburg and especially not to the fans. This would be no big deal if Strasburg was a No. 4 or No. 5 starter, but that’s not the case. Strasburg is the team’s ace and could have been a Cy Young candidate if he pitched the whole season. Washington messed up with this situation right away over the spring. The plan to shut down Strasburg at 160 innings should have never been announced at spring training. Why would you let the rest of the league know your team’s best pitcher won’t be pitching for most of September and not at all in the playoffs? That makes no sense. A pre-established innings count for Strasburg is also unnecessary. I understand the kid is only 24-years-old and has already had Tommy John surgery, and so you’re looking out for his and the team’s future. Instead of an innings count, Strasburg should have been monitored medically to determine how much he would pitch in 2012. 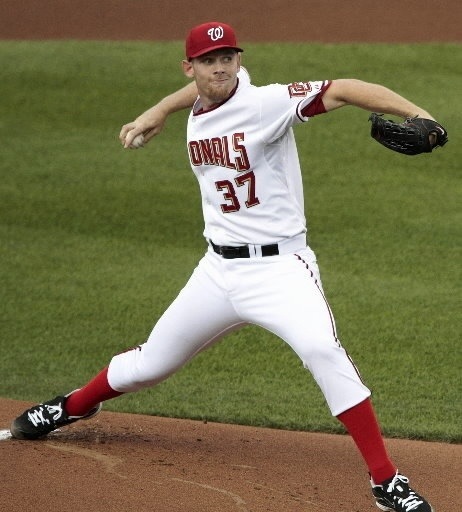 If Strasburg felt tightness in his elbow or shoulder, then absolutely he should be shut down. Same goes for if he was fatigued or losing flexibility, but none of that happened. Strasburg feels healthy and is not on board with the team management’s decision. Strasburg has every right to feel that way and should. As a competitor you want the ball in your hands as much as possible — not for a certain amount of time determined by team management. Enough about looking out for the team’s future. Just like Herm Edwards said, “You play to win the game.” Washington is not doing that, but instead playing to win five years from now. There’s no predicting how good the Washington Nationals or Stephen Strasburg will be in the future. Right now, they’re one of the best teams in baseball and have a serious shot at the World Series with Strasburg on the hill. The Nationals will not be as good without Strasburg pitching, but luckily, they are a pretty good team, even without him. The team has serious home run power, with 19-year-old phenom Bryce Harper heating up at the right time. The Nationals also have another Cy Young candidate in Gio Gonzalez, who is at the top of the league in wins and ERAs. On baseball’s biggest stage, the game will be missing one of their biggest stars. Instead of seeing Strasburg in the playoffs, he was shut down after going 15-6 with a 3.16 ERA and 197 strikeouts in just 159.1 innings. The Washington Nationals better hope their plan works or else they will greatly regret blowing their chance to win their first World Series championship in franchise history.